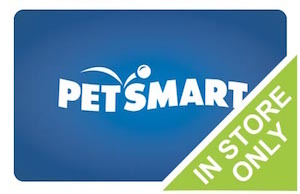 A discounted PetSmart gift card is a sure way to save money on all your pet supplies! And with departments in dog, cat, fish, bird, reptile, and small pets, you are sure to find everything you need. But that’s not all! You can use your card to save money on their pet services too! Whether you are looking for dog training, grooming or daycare, when you use your discounted card, you will pay less money on your entire bill! Founded in 1986 in Arizona, by 2016 there were over 1,400 stores across the United States. And with this many stores, it is likely you have one located close to you. Purchase your PetSmart gift card today and start saving money for all your pet’s needs! And for even more savings, join their pet perks reward program to earn redeemable points on every purchase. Owning a pet can be expensive. But with Cards2Cash on your side, you can afford everything you need to give your pet a happy and healthy home! As of September 2016, PetSmart has helped 7,000,000 stray animals find forever homes. Now, that’s a lot of happy pets! So, when you use your PetSmart gift card, you can rest assured that you are supporting a store that stands behind a worthy cause. Discounted prices and a good cause, what can be better than that? Get your card today and stretch your dollar farther than it has ever gone before on everything your pet needs! Do you have a gift card that you aren’t going to use? Cards2Cash will turn that unwanted card into money! We pay the highest possible price for all gift cards. Why hold on to a card you will never use when you can have cash instead? If interested, visit one of our retail locations, and we’ll pay you on the spot, OR you fill out our easy online form, and we’ll get back to you with an offer you won’t want to refuse. Whether you want to buy a gift card or sell one, Cards2Cash is your one-stop gift card shop!